Before Coach Paul Bryant made the houndstooth fedora an icon of Alabama football, there was Hugh Rowe Thomas' hat. 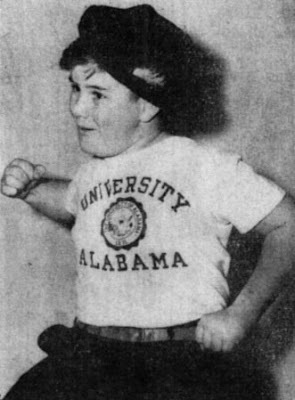 In 1944, the 11-year-old son of Alabama's football coach Frank Thomas wore a red hat that brought the team luck almost the entire season. 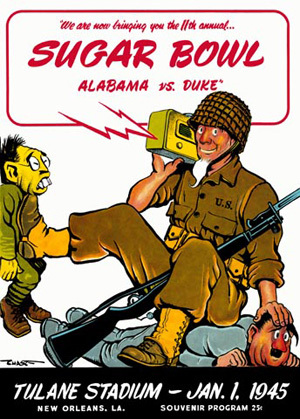 Fred Digby, the Sports Editor for the New Orleans Item who promoted the Louisiana game tirelessly in its formative years and bequeathed it the name "Sugar Bowl," featured the young Thomas in a column prior to the 1945 New Year's Day game that pitted the Crimson Tide against the powerful Duke Blue Devil's squad. Thomas's decreed the hat to be the team's good luck charm in Alabama's game that season versus Kentucky on Oct. 27, 1944 when he made a wish the Crimson Tide would intercept a Wildcat pass. "I ran my finger around the rim and made a wish," he told Digby. "On the next play we intercepted a pass and then we won. Every game since I ran my finger around my hat and that's all there is to it." If there was any doubt in the sixth grader's mind it was resolved a week later in Alabama's contest against Georgia at Legion Field. Thomas would often work in the press box as a spotter and accidentally left his hat on the team's sideline bench after accompanying his father and the Crimson Tide team onto the field. The Bulldogs won the game 14-7. Thomas promised Digby he would be wearing his hat for the Sugar Bowl and predicted his father's team would win 13-8. The hat's powers either didn't work in New Orleans or expired at the end of the calendar year. Duke won the game 29-26. Thomas eventually graduated from the University of Alabama and became an insurance agent in Tuscaloosa. He was elected to the state House of Representatives in 1966 but served just more than a year. In April 1967 he was killed in a car wreck near Maplesville while travelling to Montgomery for a special session of the legislature. He was 33. The six-lane highway bridge over the Black Warrior River connecting Tuscaloosa and Northport that was approved in that legislative session was named in his honor. The structure was dedicated in December 1973 and opened the following month.